Tucked away on page six of the International Rugby Board's November 2004 mission statement is a startling prediction about this year's World Cup. Amid arrows that climb upwards to an ever-richer, higher-profile future is the claim that 10 teams should be "capable" of reaching the 31 October final at Twickenham. Considering only eight teams have ever made the semi-finals in the tournament's history, it is a bold suggestion. The story of Samoa, eliminated in the group stages at the last three tournaments but brimful of raw talent and proud history, illustrates why the target of the IRB, now World Rugby, is not a realistic one. And why the the game's governing body itself is, at least partly, to blame. Last November, the All Blacks, Australia, France and Italy posted pictures on Twitter in support of Samoa ahead of their Test against England. The Samoa United campaign wasn't driven by anti-English sentiment, but concern for their fellow professionals. For while each of the home players in that Twickenham match earned £15,000, Samoa's squad were on approximately £500 a week - around £70 a day - during their northern hemisphere tour. That figure had not changed for more than 20 years and, according to players, would frequently be delayed or held back in part by the Samoan Rugby Union. At the last World Cup in 2011, some overseas-based players effectively played for Samoa for free once they paid for their own flights. So, in November, Samoa threatened not to take to the field against England in protest at the irregularity and level of pay, as well as complaints that internal politics at the Samoan Rugby Union were interfering with team selection. The union's president - also the country's prime minister - responded by calling his squad "little brats". World Rugby hastily got involved and a new agreement was finally reached at the end of August, just weeks before the start of the World Cup. The union said it provided "certainty for players regarding fees" but made no mention of any increase. "Some of the guys are amateurs and rely on this money to put food on the table," said Mahonri Schwalger, who skippered the side in the 2011 World Cup but has not been picked since then after criticising the management after the tournament. "The SRU needs to realise this is a new era. Guys are making a career out of the sport and they need to pay the bills and pay the mortgage. Mentally you do not want to be thinking about these things before a big game." It is a scenario a world away from the England player who joked that their World Cup quarter-final exit in 2011 meant "£35,000 down the toilet" rather than in his pocket. Census Johnston, a keystone of the Samoa front row, admitted in April his decision to end his international career to focus on playing for Toulouse less than six months before the World Cup "might seem strange". Yet not only did Johnston, 34, play for Samoa in their historic home Test against the All Blacks in July, he has been called up for their World Cup squad. The French side were not amused by his appearance against New Zealand, with sporting director Fabien Pelous describing it as "unsettling" and first-team coach Ugo Mola warning it would have "consequences". Toulouse have not yet reacted to the news he will not be playing for them in the Top 14 this autumn. London Welsh second row Dan Leo claimed in May - before Samoa team-mate Johnston's apparent U-turn - that Pacific Islanders were being put under pressure to give up international rugby by their clubs. Claims of clubs offering two different contracts - one with international rugby, one without and a 30-40% difference to the bottom line - or inducements to declare themselves unavailable to their country are not new. After the last World Cup, Simon Mannix, Racing Metro's coach during the tournament, claimed three of the club's Fijian players did not go to New Zealand "because the club gave them a cheque if they stayed". In England, Premiership clubs receive more than £175,000 a year for each player they provide to the national squad, but get no such compensation while their other internationals are unavailable. Samoa wing Alesana Tuilagi and his England centre brother Manu, according to their agent, had their wages cut by Leicester during the 2011 tournament. Leicester would only say the details of contracts were "confidential". A more competitive World Cup? World Rugby analysed the opening pool matches at the last three World Cups - looking at instances where a Tier One side met a Tier Two opponent. In 2003, the Tier One side's average winning margin was 45 points. In 2007, it was 41 points and by 2011 it had fallen to 20. World Rugby's own code expressly forbids clubs "whether by contract, conduct or otherwise inhibiting, preventing, discouraging, disincentivising or rendering unavailable" players from international selection, stressing that high-quality international rugby is the lifeblood of the game. But the emphasis is on players bringing cases to them rather than the governing body proactively seeking out violations. Eliota Fuimaono-Sapolu is a qualified lawyer, a former Gloucester centre and a member of Samoa's 2011 World Cup squad. "I had one year on a full salary at Gloucester and then the next year they changed it and put it into match fees. If I wasn't there I didn't get my money," he told BBC Sport. "For someone on a decent contract, getting £3,000-£4,000 a week, when you get that cut and instead get maybe a tenth of that - it's a big loss." "There is a very strong fairness in terms of the times of rest periods," World Rugby chairman Brett Gosper said in April 2013 ahead of the publication of the 2015 World Cup fixture list. "It will be the same for all teams - far more equal, completely equal." It certainly wasn't in 2011. Then, hosts New Zealand had their pool matches spread over 24 days while England's were in 22 days. Pretty much all Six Nations and Rugby Championship teams had a more leisurely schedule than those outside the game's elite, some of whom packed four matches into 17 days. The rationale given was that with the tournament in a less lucrative time zone, the 'big names' had to be given prime time fixture slots to generate the revenue that would in turn be used to build the game around the world. 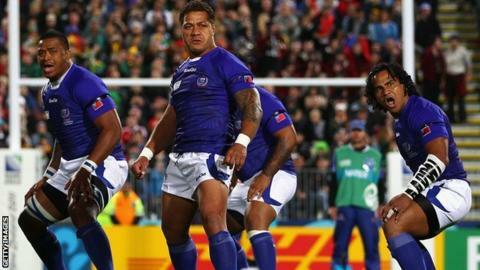 Fuimaono-Sapolu criticised 2011's two-speed fixture list, claiming Samoa would have "killed" Wales had they, rather than their opponents, had three days' extra rest. As Rugby World's analysis shows, 2015 is more equal but still some way short of the "completely equal" promised by Gosper. Canada, Tonga, Namibia, Fiji and Romania will twice play matches off the back of four days or less rest, with the tournament's big names all spared tight turnarounds. Rugby-playing nations are divided into different tiers by World Rugby. These were initially based upon "playing strength and potential", but World Rugby's own ranking suggests there is little difference between Italy and Scotland in tier one and Samoa, Tonga and Fiji in the strata below. These classifications matter as they decide the funding and support which flows back to unions from World Cups which, this time around, is expected to generate about £180m profit. World Rugby has trumpeted £34m investment in tier two nations since the last World Cup. However, with less fanfare, the 10 tier one nations have been paid more than double that - £7.5m each - from World Cup coffers to compensate for the revenues they might have earned organising matches during the time of the World Cup. With a £4m fund to be split among all the teams in increasing amounts depending on progress in tournament, even exceptional performance won't carry a huge financial reward for a 'lesser light'. "Those millions of pounds of profit are not World Rugby's money - that is money they owe the tier two nations," said Fuimaono-Sapolu. "If you take those 10 tier two nations out there is no 'World' Cup. That is not charity. At the last World Cup, Samoa sold out Hamilton, Eden Park, Albany. That money should come to the tier two already by right and there should be more of it." Instead, Samoa felt they needed to hold a fundraising drive before the 2011 World Cup, seeking support from a population with an average annual income of £3,371. Outside of their World Cup income, the Samoan Rugby Union's chances to make cash are slim. Unable to convince big unions to tour - New Zealand's visit this summer was their first - Samoa have to travel to meet tier one opposition. But away days don't pay. Their hosts keep all of the gate money, television receipts and bar takings. So while England's players joined in prayer with their Samoa counterparts after their November test, the RFU retained the estimated £2m generated by an 84,000-sellout and paid Samoa a £45,000 appearance fee. "This money is going to the same people it has gone to for time immemorial. It is neo-colonisation, and a brilliant, fraudulent arrangement," added Fuimaono-Sapolu. Twenty-five years ago Samoans watched as one of their own, Va'aiga Tuigamala, rampaged through backlines wearing the All Blacks jersey. More recently, they have seen Manu Tuilagi, whose five older brothers have all represented Samoa, doing something similar for England. Times change, but the stream of Samoan talent re-emerging, after three years residency, in the colours of another nation continues. Schwalger now runs a rugby academy in Samoa and believes that while it may offend rugby romantics, realists will understand that schooling Samoa's brightest prospects overseas ultimately strengthens the national team. "At the moment, schools in Australia and New Zealand and clubs in Europe are offering our kids opportunities we cannot," he says. "We don't have finances, we don't have facilities, we don't have the coaches - so the only way to develop our kids is to send them out. "They can play a better level of rugby out there and hopefully come back and represent Samoa in the future. "Not everyone can play for the All Blacks! Eventually Samoan people will realise that if other countries come over and take our kids, it is a blessing." After Wales famously lost to Western Samoa - as Samoa was formerly known - at the 1991 World Cup, the joke was that Alan Davies' side were lucky they weren't facing the whole of Samoa. Come 2015 and the rest of the rugby world might be even luckier not to be facing a Samoa side with the resources and advantages of their opponents. Read more on Rugby World Cup 2015: What's the state of the home nations?